The Juggernauts debut Phoenix on Out Of Line Records ! Finally, ‘Phoenix’ the highly anticipated debut EP of the fresh sounding Belgian electro EBM combo The Juggernauts is imminent! Featuring the killer dance floor single Phoenix (taken from the upcoming album ‘The Juggernauts are Coming’) itself, Damaged Illusions and the EP exclusive track Infected. This EP is features also excellent remixes by some their friends and supporters Spetsnaz, Plastic Noise Experience, Implant & True Zebra! This is a 666 pcs. Limited edition Digipack! So come get you copy! We are pleased to announce you the line up for our 3rd New-Wave Club Night on Saturday April 6th! 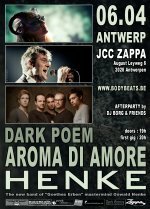 After we had The Bollock Brothers & Adam Ant headlining our previous editions we now have a double bill with HENKE, the new band around Owald Henke of the German cultformation Goethes Erben) and one of Belgiums most legendary indie-wave bands AROMA DI AMORE. The enchanting and musical fairies from DARK POEM have the honnour to open the night! New-Wave/EBM/Electro/indie afterparty with DJ BORG & Friends! Interview with BIMFEST 2012 headliner Peter Hook & The Light! Read more on the link below! While the countdown to BIMFEST 2012 has reached his final week Peek-a-Boo & Dark Enries Magazine managed to have an interview with our Friday night BIMFEST 2012 headliners TEST DEPT:Redux! 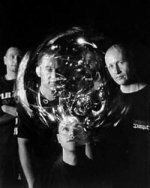 Read the interview on the link below and find out what Test Dept:Redux is about and what you can expect from them on December 14th @ BIMFEST! Tickets are still available on this site, Wool-e shop (Ghent), Fat Kat Records (Antwerp) & Fnac. An Interview with Adam Ant on Peek-a-Boo magazine! 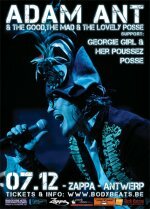 Our befriended independent music magazine and Partner Peek-a-Boo published an interview with Adam Ant. Click the link below and find out what you can expect this Friday night!